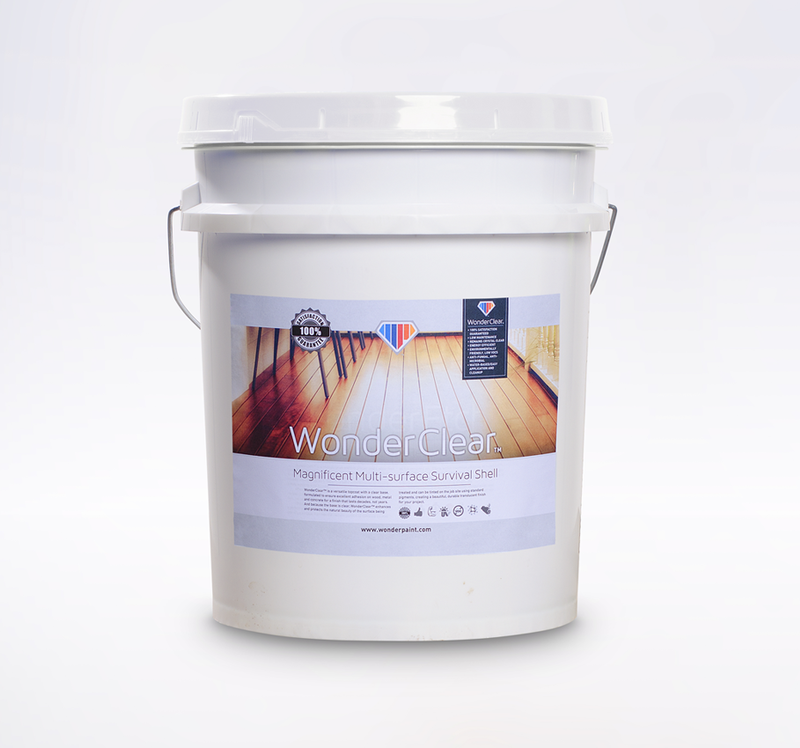 WonderClear™ is a versatile topcoat with a clear base, formulated to ensure excellent adhesion on wood, metal and concrete for a finish that lasts decades, not years. And because the base is clear, WonderClear™ enhances and protects the natural beauty of the surface being treated and can be tinted on the job site using standard pigments, creating a beautiful, durable translucent finish for your project. SUPERIOR CHEMISTRY WonderClear™ has the ideal balance of flexibility and hardness to ensure long service life. It is engineered to breath, allowing water vapor to escape while preventing liquid water from penetrating — providing protection from the damage caused by acid rain, bacteria and fungus growth, preventing unsightly stains. Plus, WonderClear™ has a unique UV package that offers protection from the harmful rays of the sun, while making it energy efficient by reflecting up to 96% of UV radiation. For all these reasons, WonderClear™ is an ideal topcoat for other WonderPaint™ products like Preventex™ and WonderCrete™. 100% SATISFACTION GUARANTEED The proprietary science behind WonderClear™ exhibits elastomeric properties with very high strength and UV-resistance. So, it adheres better and last longer without cracking, peeling, fading, chipping, chalking, staining, scuffing or yellowing. LOW MAINTENANCE WonderClear™ is extremely low-maintenance: simply clean with mild soap and water as needed. REMAINS CRYSTAL CLEAR WonderClear™ has a unique UV package of both organic and inorganic UV protection which prevents yellowing, fading and changes to the coating’s texture and appearance. ENERGY EFFICIENT The WonderClear™ high performance acrylic-urethane system uses nano-crosslinking technology that adapts to its elements. The UV package in WonderClear™ reflects 96% of the energy that strikes its surface, saving more than 40% of cooling costs in summer and preventing heat energy loss in the winter. ENVIRONMENTALLY FRIENDLY, LOW VOCS WonderClear™ is environmentally friendly, non-toxic, readily biodegradable, non-flammable, free of Volatile Organic Compounds (VOCs) and safe for the environment. ANTI-FUNGAL, ANTI-MICROBIAL WonderClear™ contains ingredients that make it impossible for mold or mildew to form once the product has been applied and cured. This keeps mold and mildew from destroying the integrity and appearance of the surface. WATER-BASED/EASY APPLICATION AND CLEANUP WonderClear™ is water-based and environmentally friendly, making it easy to apply and clean up using just mild soap and water.